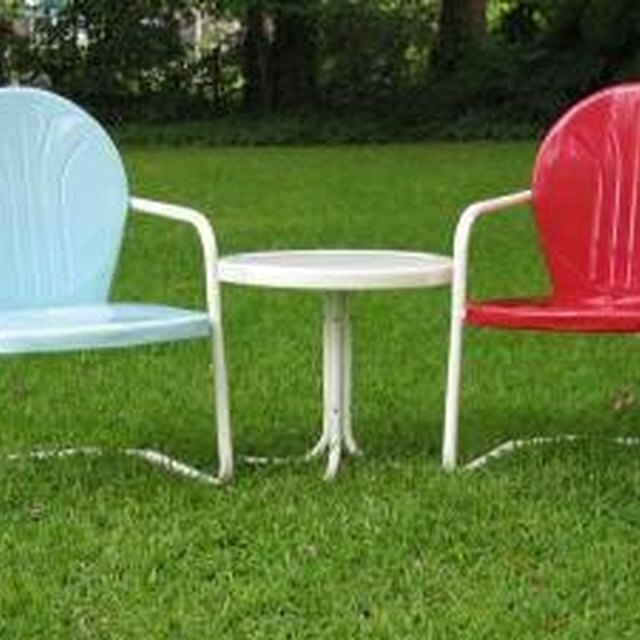 When you purchased your lawn chairs, you shopped from different styles made of various materials. Testing durability, space and comfort, you sit in lawn chairs, and you read instructions on how to care for your purchase. Finally, you bring your indoor chic out to the patio. In time, however, you will need to replace the fabric on your lawn chair. Eventually, the fabric on your lawn chairs must be replaced. Carefully remove the plastic end caps on the chair, using a flat-head screwdriver. Unbolt the sling rails. Spray the old material along the sling rails with soapy water. Let the soap absorb. Notice the position in which you will replace the rails. Pull the material from the sling rails with a pair of pliers. Remove all the bolts that attach the sling rails to the chair. Clean these to reuse with the new sling installation. Run the splines through the new sling. Make sure the rails are positioned the same as they were before you removed the old sling. Align the holes for the bolts in the chair with the holes in the sling rails. Insert the bolts and tighten them by hand. Make sure the rails are even at the bottom of the chair. Cinch the bolts tighter to keep the fabric in place. Stand behind the chair and stretch the fabric upward. Clamp one side in place while you stretch the other. Tighten all the bolts now. Cut any excess sling spline with scissors. Tap the end caps into place using a mallet. Unscrew the old webbing with a screwdriver, or the correct tool for your chair. Clean and save the screws to replace the new fabric. Place the front of the chair down and work from the back. Fold the corners of one end of the fabric strip to a point, and make a hole in the material. Work vertically to bring the strip of webbing from the front of the chair. Wrap it around the back to the inside and line up the holes. Attach the new material with a screw. Pull the strip of fabric tight to the opposite side of the chair. Cut excess fabric, form a triangle, and screw into place. Repeat Steps 2 through 4, stretching the vertical strips before working horizontally. Attach and weave the first horizontal strip. Make adjustments before cutting excess material. Complete the final steps, pulling the weave tight. If the material does not loosen, use a flat-head screwdriver as a wedge. Keep the care instruction label on the back of the chair, at the top, as a guide. Loosen rusty bolts or screws with a penetrating oil spray. Use the old web material as a guide for measuring and cutting the new fabric strips. The end caps may break due to age and weather. Sabiene Annwrit's writing career began after she graduated from the Institute of Children's Literature in 2008. She has taught creative writing to grades 6 through 12, edited web pages and has written business letters, proposals, resumes and advertising materials for more than 28 years. How do I Repair a Mesh Chair? How do I Repair Coleman Lawn Chairs?